When visiting a new city, it’s always great to taste the local food. But many travelers also know that it’s smart to search for food places that locals love, and Mex Cantina is one of them. 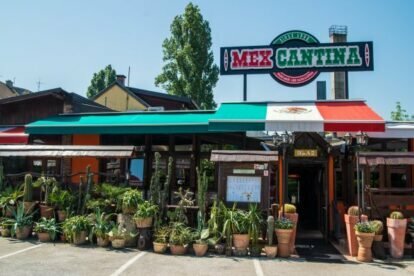 For us locals in Zagreb, this is the number one place to be if we’re in the mood for some Mexican flavors. This little spicy gem in Savska street offers big portions of delicious food for affordable prices. A dinner for two, with drinks included, can cost well under 50€. This is the reason families, friends and groups choose Mex Cantina for dinner dates or celebrations. My favorite here is De salmon – fried tortillas filled with salmon, cherry tomatoes and yogurt dressing. The freshness of the fish combined with the lime and dressing makes this dish really stand out for me. If I am really hungry, I go for Quesadillas grandes de pollo – large chicken quesadillas with chipotle. It’s a bit spicy, which I like, but the chicken and avocado are the real winners in this dish! Don’t forget that here you can find some of the finest brands of tequila, not served anywhere else in town! True tequila lovers like myself know that not everything named tequila tastes like tequila. Mex Cantina never disappoints true gourmands. Tasting the freshness of ingredients in every bite as well as the chef’s experience, love and respect for food make this restaurant one of the classics for me. Offline Zagreb tips? Get our iPhone / Android app!